Introducing the next level in world-class non-powered mixer performance. The all new PV® series mixing consoles include Peavey's reference-quality mic preamps that spec in at an incredible 0.0007% THD, making the PV series mixers excellent for live or recording applications. 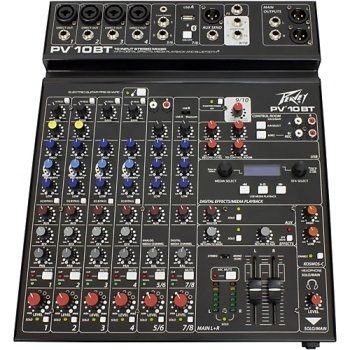 The PV 10 BT includes 4 channels of reference quality mic preamps, 4 direct outputs for recording, a stereo channel, media channel with Bluetooth® wireless input, high quality digital effects with LCD display, streaming USB out, MP3 playback via USB A input, Peavey's exclusive Kosmos® audio enhancement, 48-volt phantom power, dual selectable control room outputs, 2 channels of compression, one channel of on board selectable guitar preamp, 3-band EQ per channel with bypass, channel mute buttons, aux send, signal clip indicators, and a stereo master LED meter bridge. This amazingly versatile mixer is at home both in the studio as well as live applications.